The prophecy of the "spark from Poland" which would prepare the world for the Second Coming of Christ is one of the most well known private revelations given to St. Faustina Kowalska (1905-1938), the Apostle of Divine Mercy. For obvious reasons, many Catholics believe that this prophecy was fulfilled by elevation of Polish Cardinal Karol Wojtyla to the pontificate as Pope John Paul II in 1978. Pope St. John Paul II, who was raised to the altars on Divine Mercy Sunday, 27th April 2014, alongside Pope St. John XXIII, was undoubtedly the world's greatest devotee of St. Faustina's private revelations concerning Divine Mercy. But what is the exact meaning of the prophecy of the "spark from Poland"? And in what way could Pope St. John Paul II have prepared the world for the Second Coming of Christ? For St. Faustina, the coming of the Day of Mercy was closely associated with the arrival of the Second Pentecost, when the Holy Spirit would be poured out on humanity during the Last Days, allowing the Gospel to be proclaimed throughout the entire world before the Second Coming of Christ. Sr Faustina's canonization has a particular eloquence: by this act I intend today to pass this message [of Divine Mercy] on to the new millennium. I pass it on to all people, so that they will learn to know ever better the true face of God and the true face of their brethren. by the Pope. She recorded that the "crowd was so enormous that the eye could not take it all in. Everyone was participating in the celebrations" (Notebook III, 1044). This of course came to pass during her canonization mass in St. Peter's Square in the year 2000, at the same time the basilica of the Divine Mercy Sanctuary in Krakow was being constructed at the site of her local chapel between the years 1999-2002. This basilica was in turn consecrated by St. John Paul in 2002. Jubilee of Redemption. When we went to take part in the celebrations, my heart leapt with joy that the two solemnities were so closely untied. Feast of Divine Mercy was extended throughout the whole Church on the Great Jubilee Year of the Incarnation, celebrating 2000 years since the Eternal Word of God became Flesh in the womb of the Blessed Virgin Mary. The timing of Pope St. John Paul II's inauguration of the Feast of Divine Mercy during the Great Jubilee Year was thus a deliberate act intended to highlight the prophetic importance of the private revelations of St. Faustina in relation to the turn of the millennium. As the Holy Father explicitly stated himself, the symbolism of his actions during the Great Jubilee of the Incarnation was intended to be "a prophecy of the future". as we lived this Jubilee not only as a remembrance of the past, but also as a prophecy of the future. of St. John Paul II to the realization of the era of peace promised by Our Lady of Fatima. Jesus told Sr Faustina: "Humanity will not find peace until it turns trustfully to divine mercy" (Diary, p. 132). Through the work of the Polish religious, this message has become linked for ever to the 20th century, the last of the second millennium and the bridge to the third. A year ago I published the encyclical Dives in Misericordia. This circumstance made ​​me come today to the Shrine of Merciful Love. 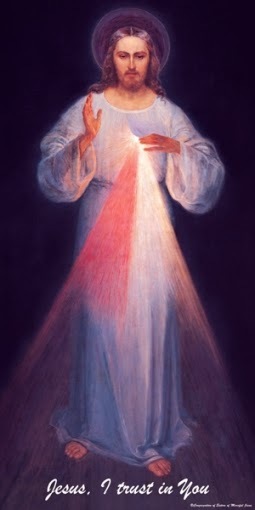 With this I would like to reconfirm the presence, in some way, the message of the encyclical [concerning Divine Mercy]. I would like to read it again and again to pronounce it. From the beginning of my ministry in the See of Peter in Rome, I felt this message as my particular task. Providence has assigned me in the situation of man, the Church and the world. You could even say that precisely this situation assigned me as a task that message before God, which is Providence, which is inscrutable mystery, the mystery of Love and Truth, Truth and Love. And my personal experiences this year, associated with the events of May 13, as part of their order me to shout: "misericordiae Domains, quia non sumus consumpti" ["Because of the Lord's mercy we are not consumed"]( Lam 3:22). The connection between the institution of the Feast of Divine Mercy and the promises of Our Lady of Fatima in the mind of St. John Paul II were also made clearly manifest in his actions during the Great Jubilee Year, as just two weeks after he had extended Divine Mercy Sunday to be observed by the whole Church on 30th April, 2000, he beatified two of the shepherd children of Fatima, Francesco and Jacinta Marto on May 13th, 2000, whilst also announcing his intent to publish the Third Secret of Fatima. The fact that Pope Francis is very specific in this time frame (thirty years), clearly points to the 1984 consecration, the fruits of which is widely recognized by Church leaders to have led to the eventual collapse of the Soviet Union in 1991. Within a year of this consecration, Mikhail Gorbachev was made General Secretary of the Communist Party of the Soviet Union, whose reformist policies of Glasnost and Perestroika inadvertently paved the way for the revolutions of 1989, which led to the dissolution of the Soviet Union in 1991. 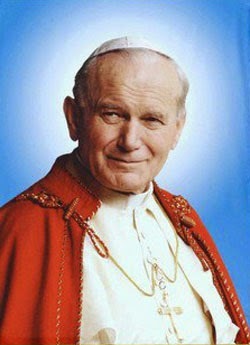 Pope St. John Paul II is himself widely credited as the single greatest influence in the downfall of the Soviet Union, as he was the primary inspiration for the Polish Solidarity movement, which having forced Gorbachev to implement his reforms, eventually led to the outbreak of the 1989 revolutions that began in Poland itself. And without the collapse of the Soviet Union, there would be absolutely no hope for the future conversion of Russia, which Our Lady of Fatima had promised as the ultimate fruit of the era of peace. It is during era of peace/Second Pentecost that the Bride prepares itself for the Coming of the Bridegroom by becoming purified in the fire of the Holy Spirit. We can see from these examples alone how St. Faustina's prophecy of the "spark from Poland" that prepares the way for the final Coming of Christ was fulfilled in the life and ministry of Pope St. John Paul II. According to St. Faustina herself, this prophecy is also intimately related to the "Day of Mercy" which takes place before the coming of the Day of Judgement, so it could not be any more fitting that it was St. John Paul II who presided over the institution of the Feast of Divine Mercy during the Great Jubilee Year. The importance of the connection between St. John Paul and this feast day was made even more explicit in the fact that he passed away on the vigil of Divine Mercy Sunday, 2nd April, 2005.
the face of this land." During the canonization Mass of St. Faustina, St. John Paul further implied a connection between the institution of the Feast of Divine Mercy Sunday and the eschatological outpouring of the Holy Spirit during the Second Pentecost, by looking to the prophetic symbolism behind the original events that took place on this day. "Give thanks to the Lord for he is good; his steadfast love endures for ever" (Ps 118: 1). So the Church sings on the Octave of Easter, as if receiving from Christ's lips these words of the Psalm; from the lips of the risen Christ, who bears the great message of divine mercy and entrusts its ministry to the Apostles in the Upper Room: "Peace be with you. As the Father has sent me, even so I send you... Receive the Holy Spirit. If you forgive the sins of any, they are forgiven; if you retain the sins of any, they are retained" (Jn 20: 21-23). Before speaking these words, Jesus shows his hands and his side. He points, that is, to the wounds of the Passion, especially the wound in his heart, the source from which flows the great wave of mercy poured out on humanity. From that heart Sr Faustina Kowalska, the blessed whom from now on we will call a saint, will see two rays of light shining from that heart and illuminating the world: "The two rays", Jesus himself explained to her one day, "represent blood and water" (Diary, Libreria Editrice Vaticana, p. 132). Divine Mercy Sunday was also traditionally known as "St. Thomas Sunday", because this was the day on which the Risen Lord showed the doubting Apostle the wounds on His hands and the wound in His side from which the blood and water had flown. As St. John Paul points out, it is at this moment, when the Risen Christ showed the Apostles His wounds, he simultaneously promises them the Holy Spirit, and grants them the power to forgive sins - which is the very essence of the message of Divine Mercy. ‘Out of his heart will flow rivers of living water.’ Now this he said about the Spirit, whom those who believed in him were to receive, for as yet the Spirit had not been given, because Jesus was not yet glorified. "as the Apostles once did, today too humanity must welcome into the upper room of history the risen Christ, who shows the wounds of his Crucifixion and repeats: Peace be with you!" When we take into consideration the other major prophetic action taken during the Great Jubilee Year, when St. John Paul II once again consecrated the world to the Immaculate Heart of Mary in unison with the bishops of the world on 8th October, 2000, we are reminded of St. John Bosco's prophetic dreams of the Two Pillars and the March of the 200 Days. In his Dream of the Two Pillars, after two sets of "meetings" which represent the First and Second Vatican Councils, Don Bosco sees a pope who is "gravely wounded" by his enemies. While many have linked this part of the dream to the assassination attempt on Pope St. John Paul II in 1981, this interpretation fails to take into account the fact that the March of the 200 Days points to the year 1999 for the fulfillment of the prophecy of the pope who anchors the barque of St. Peter between the two pillars. Each of the four hundred days in this prophecy represents a month, giving a total of 33.333 years, and calculating from the close of the Second Vatican Council in December 1965, this brings us up to the year 1999 (see the post St. John Bosco and the Turn of the Millennium for more information on this topic). This means that the pope who secures the barque to the two pillars of devotion to the Eucharist and the Immaculate Virgin at the turn of the millennium must be St. John Paul II. If this is correct, then the Dream of the Two Pillars gives an exact sequence of the popes who lead the Church following the Second Vatican Council, up until the turn of the millennium. The pope who is "gravely wounded" by the enemies of the Church after Vatican II would be Pope Paul VI, whose pontificate encompassed the cultural revolution that has resulted in the massive decline in the influence of the Church in modern culture - the beginning of the Great Apostasy. The pope who is killed by the enemies of the Church would therefore be Pope John Paul I, who many believe was the victim of a sinister assassination plot. Unfortunately, the truth surrounding John Paul I's sudden death is now almost impossible to ascertain. The mention of the unusually rapid series of papal conclaves may allude to 1978 as the "year of three popes", due to this exceptionally short 33 day pontificate. “Imagine yourself to be with me on the seashore, or better, on an isolated rock and not to see any patch of land other than that under your feet. On the whole of that vast sheet of water you see an innumerable fleet of ships in battle array. The prows of the ships are formed into sharp, spear-like points so that wherever they are thrust they pierce and completely destroy. These ships are armed with cannons, with lots of rifles, with incendiary materials, with other firearms of all kinds, and also with books, and advance against a ship very much bigger and higher than themselves and try to dash against it with the prows or burn it or in some way to do it every possible harm. “As escorts to that majestic fully equipped ship, there are many smaller ships, which receive commands by signal from it and carry out movements to defend themselves from the opposing fleet. In the midst of the immense expanse of sea, two mighty columns of great height arise a little distance the one from the other. On the top of one, there is the statue of the Immaculate Virgin, from whose feet hangs a large placard with this inscription: Auxilium Christianorum—”Help of Christians”; on the other, which is much higher and bigger, stands a Host of great size proportionate to the column and beneath is another placard with the words: Salus Credentium—Salvation of the Faithful. “The supreme commander of the big ship is the Sovereign Pontiff. He, seeing the fury of the enemies and the evils among which his faithful find themselves, determines to summon around himself the captains of the smaller ships to hold a council and decide what is to be done. “All the captains come aboard and gather around the Pope. They hold a meeting, but meantime the wind and the waves gather in storm, so they are sent back to control their own ships. There comes a short lull; for a second time the Pope gathers the captains around him, while the flag-ship goes on its course. But the frightful storm returns. The Pope stands at the helm and all his energies are directed to steering the ship towards those two columns from whose summits hang many anchors and strong hooks linked to chains. “All the enemy ships move to attack it, and they try in every way to stop it and to sink it: some with books and writings or inflammable materials, of which they are full; others with firearms, with rifles and with rams. The battle rages ever more relentlessly. The enemy prows thrust violently, but their efforts and impact prove useless. They make attempts in vain and waste all their labor and ammunition; the big ship goes safely and smoothly on its way. Sometimes it happens that, struck by formidable blows, it gets large, deep gaps in its sides; but no sooner is the harm done that a gentle breeze blows from the two columns and the cracks close up and the gaps are stopped immediately. “Meanwhile, the guns of the assailants are blown up, the rifles and other arms and prows are broken; many ships are shattered and sink into the sea. Then, the frenzied enemies strive to fight hand to hand, with fists, with blows, with blasphemy and with curses. “Suddenly the Pope falls gravely wounded. Immediately, those who are with him run to help him and they lift him up. A second time the Pope is struck, he falls again and dies. A shout of victory and joy rings out amongst the enemies; from their ships an unspeakable mockery arises. “But hardly is the Pontiff dead than another takes his place. The pilots, having met together, have elected the Pope so promptly that the news of the death of the Pope coincides with the news of the election of the successor. The adversaries begin to lose courage. If this interpretation is correct, the pope anchoring the barque of St. Peter to the two pillars of devotion to the Eucharist and the Immaculate Virgin at the turn of the millennium, must be a reference to the institution of the Feast of Divine Mercy and the consecration of the world to the Immaculate Heart of Mary during the Great Jubilee Year. 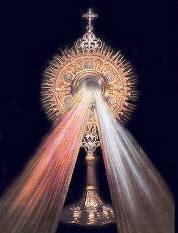 The Feast of Divine Mercy is essentially Eucharistic in character, with its emphasis on the blood and water which issued from the side of Christ as the source of the outpouring of God's mercy. By directing our attention to the blood and water which was poured out from the side of Christ, the image of Divine Mercy recalls the Eternal Sacrifice of Jesus commemorated during Mass in the Holy Eucharist; and at the same time also points forward to the future conversion of the Jews (the "house of David and the inhabitants of Jerusalem"), which the Catechism states must take place before the Second Coming of Christ. The pope securing the barque of St. Peter to the pillar bearing the Blessed Sacrament in St. John Bosco's prophetic dream appears to depict the Holy Father anchoring the Church to the devotion of Divine Mercy. The smaller column bearing the statue of the Immaculate Virgin may indicate that the consecration of the world to the Immaculate Heart of Mary during the Great Jubilee Year was of lesser importance at this particular time, given that the same ceremony was already performed previously in 1984. But it is still possesses a sufficient level of significance to warrant a place of honour in Don Bosco's dream, especially since it fulfilled the request to consecrate the world to the Immaculate Heart of Mary given to Blessed Alexandria Maria da Costa, whose feast is celebrated on Oct 13th - the anniversary of the Miracle of the Sun. The "light chains" which the pope uses to anchor the barque between the two pillars would thus be the Divine Mercy Chaplet and the First Saturdays Devotion. The fact that St. John Paul II celebrated the Great Jubilee Year by performing such highly symbolic actions was intended to highlight the prophetic significance of the millennial anniversary of the Incarnation of the Word of God in the womb of the Immaculate Virgin. The Book of Revelation presents the Blessed Virgin Mary as the new Eve, and uses the story of the nativity to demonstrate how the fall of humanity is reversed by a woman conceived without sin, who crushes the head of the Ancient Serpent by bearing God Himself into the world. It is the Incarnation of the Word which signals Satan's ultimate defeat on the Cross. Now war arose in heaven, Michael and his angels fighting against the dragon. And the dragon and his angels fought back, but he was defeated, and there was no longer any place for them in heaven. And the great dragon was thrown down, that ancient serpent, who is called the devil and Satan, the deceiver of the whole world—he was thrown down to the earth, and his angels were thrown down with him. And I heard a loud voice in heaven, saying, “Now the salvation and the power and the kingdom of our God and the authority of his Christ have come, for the accuser of our brothers has been thrown down, who accuses them day and night before our God". Note that the above mention of the "mourning" at the appearance of the "sign of the Son of Man" mentioned by Jesus during His Olivet Discourse is directly connected to the same passage in the Book of Zechariah referenced by the image of Divine Mercy: "when they look on me, on him whom they have pierced, they shall mourn for him, as one mourns for an only child" (Zech 12:10). It is perhaps of some significance then that the institution of the Feast of Divine Mercy during the Great Jubilee Year, on 30th April, 2000, took place just days before the planetary conjunction of all seven classical planets known to the ancients, which occurred on 5th May, 2000, which in turn was just days before the beatification ceremony of Francisco and Jacinta Marto on 13th May, when Pope St. John Paul II announced his intention to publish the Third Secret. We have already discussed how this event may have been related to the "sign of the Son of Man" in the post The Seven Wandering Stars and the Heads of the Dragon. This rare planetary conjunction was preceded in the previous year by one of the most widely witnessed total solar eclipses in human history - that of 11th August, 1999, whose path of totality not only crossed one of the most densely populated areas on earth, but also directly through Turkey, near the city of Izmit, where a 7.6 magnitude earthquake took place just six days afterwards, on 17th August, 1999, killing 17,000 people. Turkey also happens to be the site of ancient Asia Minor - the location of the seven churches to which the Book of Revelation was addressed, including the site of Pergamon, which the Apocalypse states is "where Satan's throne is" (Rev 2:12). So here we have two of the "signs in heaven" taking place within an incredibly close time frame - an earthquake and the sun turning black "like sackcloth", both centred upon the location to which the Apocalypse was originally addressed. When he opened the sixth seal, I looked, and behold, there was a great earthquake, and the sun became black as sackcloth, the full moon became like blood, and the stars of the sky fell to the earth as the fig tree sheds its winter fruit when shaken by a gale. Then in November 1999, there was the occurrence of the Leonid Meteor Storm, the most prolific of all meteor showers, which takes place every 33 years (which recalls what is traditionally believed to be the duration of the life of Christ). This was quickly followed just two months later at the very start of the new millennium and the beginning of the Great Jubilee Year of the Incarnation, by the appearance of a blood moon on Jan 20th, 2000 - the anniversary of the apparitions of Our Lady of the Miracle to Marie Alphonse Ratisbonne in 1842 (which prefigures the future conversion of the Jews). The institution of the Feast of Divine Mercy took place just over three months later, followed by the aforementioned rare planetary conjunction of the seven classical planets. The very next year brought the world-changing events of 9/11, which as we have already argued in the previous post The Angel of the Seven Thunders, is connected to the "blood fire and columns of smoke", which Joel prophesied would accompany the "signs in heaven" during the eschatological outpouring of the Holy Spirit. “And it shall come to pass afterward, that I will pour out my Spirit on all flesh; your sons and your daughters shall prophesy, your old men shall dream dreams, and your young men shall see visions. Even on the male and female servants in those days I will pour out my Spirit. The Dragon standing under the Woman's feet also represents the total solar eclipse at the opening of the sixth seal, which turns the Sun as "black as sackcloth". The third of the stars being swept from the sky by the Dragon's tail symbolizes the stars falling to earth; while the seven heads, which we are told bear "blasphemous names", appears to refer to the seven classical planets, which are named after pagan gods. So an alignment of the seven classical planets is also alluded to in Rev 12. On that day the LORD will punish the host of heaven, in heaven, and the kings of the earth, on the earth. They will be gathered together as prisoners in a pit; they will be shut up in a prison, and after many days they will be punished. Then the moon will be confounded and the sun ashamed, for the LORD of hosts reigns on Mount Zion and in Jerusalem, and his glory will be before his elders. In relation to this, it is interesting to note that the greatest point of eclipse on 11th August, 1999, was concentrated exactly on a town in Romania called Ocnele Mari, which translates from Romanian as "Large Prison" or "Large Pit". It seems beyond mere coincidence that an astronomical event which can be associated with the signs in heaven that herald the casting down of Satan (described by Isaiah as the gathering of "prisoners in a pit") should be directly centred on a location called "Large Prison/Pit". And that in turn, this event should take place during the millennial anniversary of the Incarnation of Christ, which is so closely associated with the promises of the Protoevangelium (that the Woman will crush the head of the Serpent), and the "Apocalyptic Nativity" described in chapter twelve of the Apocalypse. During her interview with Fr. Fuentes, Sr. Lucia stated that not only are we in the "last times of the world", but also that we were right on the cusp of a final and decisive battle between the Blessed Virgin Mary and the Devil. "Father, the Most Holy Virgin did not tell me that we are in the last times of the world, but She made me understand this for three reasons. The first reason is because She told me that the devil is in the mood for engaging in a decisive battle against the Virgin. And a decisive battle is the final battle where one side will be victorious and the other side will suffer defeat." 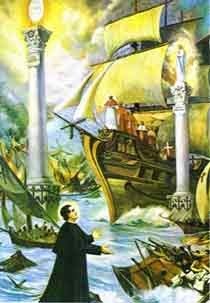 When we return to review the implications of St. John Bosco's prophetic Dream of the Two Pillars in respect to the above considerations, it is worth noting that the primary basis of this vision is rooted in the historic naval battle fought at Lepanto in 1571, the outcome of which Catholics attribute to the intercession of Our Lady of Victory. Pope St. Pius V had asked all of Europe to pray the Rosary with the intention for the victory of the Holy League against the Ottoman Turks, who were threatening to overrun the whole of Western Europe. After the Catholic forces secured a resounding victory over the Ottoman fleet, St. Pius V instituted the Feast of Our Lady of Victory, to be held each year on 7th October, which is still celebrated today as the Feast of Our Lady of the Rosary. A vital key to interpreting St. John Bosco's Dream of the Two Pillars and the March of the 200 Days can be found in his architectural plans for the Church of Mary Help of Christians in Turin, which were based on his prophetic visions. They show not only that the visions were indeed based on the Battle of Lepanto in 1571, but also dates the "new triumph of the Madonna" shown in the Dream of the Two Pillars as taking place at some point in the 20th century - which means that the fulfillment of this prophecy must be already in the past. ...additional work on the Church of Mary Help of Christians was in progress. Each of the two belfries flanking the facade was to be surmounted by an angel, nearly eight feet tall, fashioned from gilded wrought copper, according to Don Bosco’s own plan. The angel on the right held a banner…bearing the word “LEPANTO” drilled in large letters through the metal, while the one on the left offered…a laurel wreath to the Blessed Virgin standing atop the dome. In a previous design, the second angel too held a banner on which the figure “19” was drilled through the metal followed by two dots. It stood for another date, “nineteen hundred,” without the final two numbers to indicate the specific year. Though ultimately, as we have said, a laurel wreath was put into the angel’s hand, we have never forgotten the mysterious date which, in our opinion, pointed to a new triumph of the Madonna. 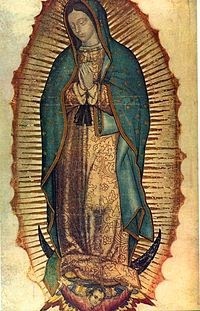 May this come soon and bring all nations under Mary’s mantle. The two angels bearing banners here are the same as that seen in St. John Bosco's March of the 200 Days. The date originally depicted in the banner of the second angel was given as 19.., but was then replaced with a laurel wreath (representing victory) being presented to the Blessed Virgin - which symbolized the time of this great Marian triumph. If we cross-reference the date presented in St. John Bosco's architectural plans with his March of the 200 Days, then the obscured date given as "19.." must be the year 1999. Another intriguing aspect in relation to this can be found in the mysterious motto ascribed to Pope St. John Paul II in the prophetic list of popes attributed to St. Malachy, De Labore Solis "From the labour of the sun" or "from the eclipse of the sun" - which is highly evocative of the prophecy of the labour of the Woman Adorned with the Sun described in Rev 12. Does this motto suggest that the prophecy of the Woman Adorned with the Sun was fulfilled during the pontificate of St. John Paul II? Writing in a commentary on the Apocalypse first published in 1955, Fr. Herman Kramer had suggested that the portion of Rev 12 which mentions the Woman giving birth to a male child who was to rule all the nations with a rod of iron, is in fact a prophecy of a particular pope. And the dragon stood before the woman who was about to give birth, so that when she bore her child he might devour it. She gave birth to a male child, one who is to rule all the nations with a rod of iron, but her child was caught up to God and to his throne, and the woman fled into the wilderness, where she has a place prepared by God, in which she is to be nourished for 1,260 days. His voice will transform the nations to brethren. My latest work, The End of the World: What Catholics Believe, has just been published by The Catholic Truth Society (CTS), the publishers to the Holy See in the United Kingdom. It is yet to be made available on Amazon, but can already be purchased directly through the CTS website itself (I'll let readers know when it becomes available on Amazon as well). 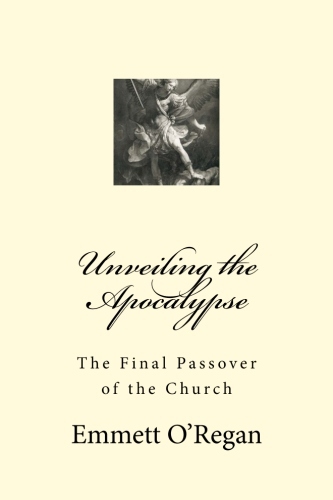 This CTS booklet traces the development of Catholic eschatology through history, and examines why some interpretations of Scripture in relation to the end-times were rejected by the Early Church, whilst outlining the position that was eventually embraced by Catholicism. In particular, it addresses the central problems posed by millenarianism in its many modern forms, and illustrates in some detail why this position is forcefully condemned by the Catechism of the Catholic Church. This short text covers a wide range of topics, ranging from the end-times literature of the Bible, to discussing the errors of Joaichim de Fiore and the Spiritual Franciscans, before moving on to the modern "Age of Mary", which was anticipated by St. Louis de Montfort during the 18th century. Our summer titles are now available covering a wide and varied range of subjects. Here on CTS Compass, we have been speaking to some of the authors of those titles to find out a bit more about them and their books. 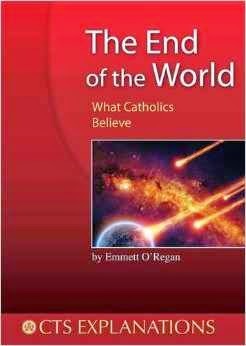 Today we publish an interview with blogger, expert and first-time CTS author Emmett O’Regan on his book, The End of the World: What Catholics Believe.